With its sturdy all-steel body, rugged 10' air tires, and solid wooden side panels, this classic red cargo wagon from Durhand is built to handle adventures both on and off road. It can manage all kinds of terrain with ease, with removable panels to keep kids and supplies safely inside. This wagon also features an extra-long handle that folds under for storage, and a controlled turning radius to prevent tipping. Add more fun to your garden and beach travels with this great exploring cart from DURHAND! - Sturdy all-steel wagon bed, can hold kids or tools up to 330 lbs. 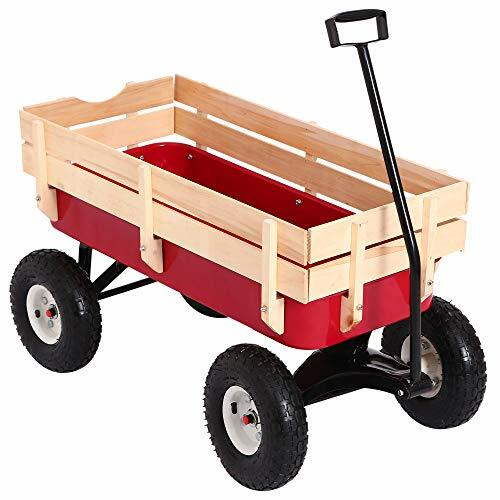 ✔ ALL-TERRAIN WAGON: Perfect for the beach, park, and sidewalk, our cargo wagon is ideal for all types of terrain. ✔ FOLD-DOWN HANDLE: The extra-long handle offers easy mobility and folds under the wagon for simple storage. ✔ REMOVABLE WOODEN SIDES: Includes removable wooden sides for greater flexibility in how you go about using it. ✔ EXTRA-LARGE CAPACITY: The extra-large wood and steel body offers maximum hauling capacity up to 330 lbs. to carry kids or cart around tools and supplies with ease. ✔ 10-INCH RUGGED WHEELS:: The 10" rugged air tires offer a smooth and comfortable ride on any terrain you take it on. If you have any questions about this product by DURHAND, contact us by completing and submitting the form below. If you are looking for a specif part number, please include it with your message.